Let me be frank: I take a lot of Instagram photos, none of which has ever made it onto this blog. Why? The simplest answer is that I'm often too lazy to write up a lengthy post to go along with every single picture, so I figured it'd be kind of silly to put any of them on my blog. See that package of candy, above? 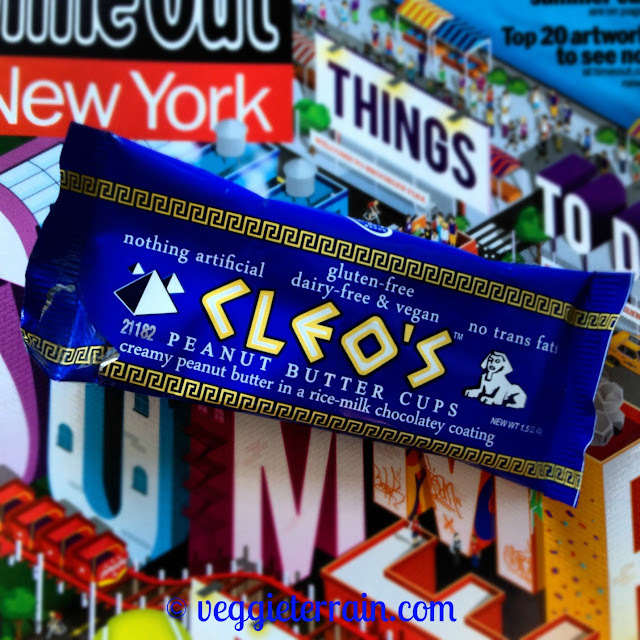 It contains Cleo's vegan, gluten-free peanut butter cups. They're made of "creamy peanut butter in a rice-milk chocolatey coating," and, I suspect, crack. They're super-sweet, decadently melty, and highly addictive. Proceed with caution. I'm glad you turned me on to these. Can't get enough!!! These are the best vegan friendly peanut butter cups in the world. They're so scrumptious, I completely agree! However, I do like the Justin's dark chocolate ones when I'm craving something a little less sweet - you should try them if you haven't! Start Your Engines, it's Almost VeganMoFo Time!